Bunnies, chicks, eggs, and more made of moist, tender cake. Package includes one dozen individually wrapped and carefully packaged pops -- popular, portable, and perfect as an Easter basket treat or delicious party favor. Each gourmet cake pop is individually wrapped for freshness, and securely placed in a craft gift box. A complimentary card with your personal message is included. Easter Cake Pops is a hand delivered gift. These gifts are delivered by one of our local design centers located throughout the United States and Canada. Same day delivery is available for most gifts when ordered before the cutoff time. The cutoff time for Easter Cake Pops is in the recipient's time zone. 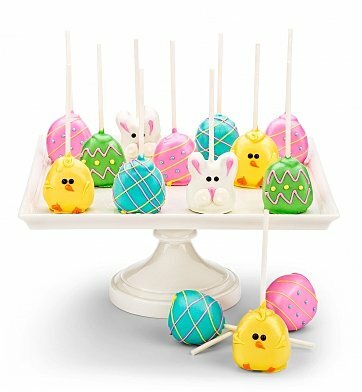 I ordered the Easter Cake Pops for my mother, she said they tasted very fresh and Oh So Good. Delivery was early, presentation was a 10, ordering was easy. I suggest GiftTree for all your special treats. Will continue to use GiftTree. 10 Stars. I was told they were delicious...once ton have assortment of favors. My mom and two daughters were over the moon at how cute and yummy the cake pops were. I say "were" because they were delivered on April 1st and I don't believe any survived to see sunrise on the 2nd. I am only sorry I didn't order a batch for myself. Looking at the picture now just makes me drool. This was a great choice for a delightful Easter gift for relatives spread coast to coast. Delivery was right on time. I will seriously consider ordering these again.